Thugs and China Dolls: Now in Stores! 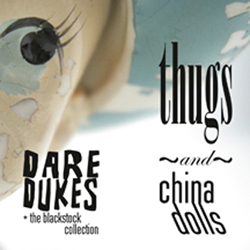 What do you know, it finally happened: Thugs and China Dolls has left the building. It is in stores today, right now. If you don’t already have a copy, perhaps now would be a good time to purchase one, be it in digital or plastic form. If you are one of those spectacularly insightful people who supported the Kickstarter campaign, you should’ve gotten your stuff a few days ago (unless you still haven’t given us your address—in which case, for godsakes, hand it over). We hope the postman got it to you intact. May it make your ears tingle. If you are in Savannah, GA, please come to one of the two record release parties: Thursday, January 19 (all ages at the Sentient Bean) or Friday, January 20 (21+ at the Jinx). Or, hell, come to both of them. We’re not messin’ around for these shows: we’ve got a six-piece band playing all kinds of doodads and noise-makers. And there are free download cards of the entire dang record for early entries. If you live in another city, please check our tour dates below for a venue near you. I recently joined Mazarine Records out of Athens, GA, and those fine people are releasing this record of mine. You can’t imagine how happy it makes me to be working with a label in a town that nurtured so many of the great bands that contiue to influence my music brain. Mazarine has all sorts of cool stuff in the works for this spring, but more on that later. We’re working on our SXSW shows. Please hold while we get those in place. There are rumors that a video for the song “Meet You at the Bus” will soon premiere, but I cannot speak to these rumors. No. I can’t. Speak. Ssh, hush now. Our final tour dates are set, with release parties in both Savannah and Brooklyn. And we’ll be touring with a—heavens to Betsy—six-piece band made up of talented folks hailing from far off locales such as Atlanta, Athens, and New York. This is for all you nice Dutch bloggers. PS. Git you to Thugs and China Dolls.